The American CyberCafé operates two forums: The Republican Forum and The Theology Forum. Politics and religion! The two so called "forbidden" topics are celebrated here! To participate more fully in these forums, please login with an existing account or register a new account. Come talk Politics and Religion with us! The American CyberCafé is THE place to gather, either at the physical location in Manaus, or here at the virtual location to meet American Friends, practice your English, and become acquainted with the larger world! It is a place for travelers to meet each other and local people both in person and online! Chat! Meet English Speaking Friends online in the Casual Chat Forum! Discuss American Politics every Saturday at 8am EDT. The American CyberCafé is both a place and a concept. It has both a physical and virtual existence. The physical café is a small piece of America in another country; a place to share American Culture, Cuisine, and Conversation, a place for American expatriates to congregate and a place for locals to meet American Friends and practice their English. But above all it is a place to sip the finest espresso while surfing the internet with Broadband. The first physical location of the American CyberCafé was in downtown Manaus, Brazil, at the meeting of the waters and the birth of the Amazon. Our hope is that this is only the first of many locations throughout Amazônia and maybe all of Brazil. 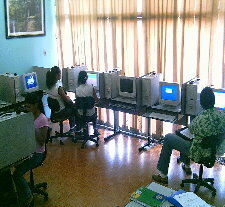 We opened this CyberCafé in January of 2005 as an experiment in providing public internet access. After one year of operation, we closed the cybercafe in order to concentratate on the main focus of our business which is providing broadband internet access via satellite to commercial clients throughout the Amazon. At that time, what was previously the CyberCafé became the offices of Amazônia Banda Larga e Informática Ltda. (ABL). If you are visiting Manaus, we welcome you to stop by and visit us at Av. Joaquim Nabuco 1088 in Centro and meet our friendly staff. We will be happy to share our internet conection with you for a few hours and talk about the future of internet access in Amazônia. It is our dream that eventually the CyberCafé will be reborn as a sidewalk resturant with free WiFi under the direction of ABL's Vice President, Sônia Patterson. Since Sônia and I own the building and in fact live with several members of our family in the rear part of the building, we hope to be one of the first to establish a resturant in Manaus with free WiFi which will be open in the evenings after normal business hours. We are right next door to a major University, Uni-Norte, and the street in front of our building is very busy during these hours. Meanwhile, the opportunity to sit and discuss ideas and to exchange conversation doesn't have to depend on you making a visit to Brazil. For a number of years now, the internet has provided a virtual meeting place where people with common interests can converse from all continents and across all time zones. It is in this spirit that I have established this web site to complement the existence of the former and future physical café. We have begun by providing links to forums which we host and some forums hosted by others which I personally recommend and participate in. Meanwhile drop by one of the recommended forums, or stop by the physical CyberCafé in Manaus, or e-mail me. I'm looking forward to getting to know you. What is the Kingdom of God and when will it come? Find out here. © 2006 by Worldwide Harvest LLC d.b.a. The American CyberCafé. All rights reserved.